Many, many thanks to “Marine Electronic Installer,” Captain Bill Bishop, for allowing us to reproduce his wry, witty account of Florida anchorage regulations. This amusing, but serious, article originally appeared on Captain Bill’s Blog (linked below)! But what has really upset all of these water based communities is that the local governments have historically had little legal authority to limit non-live-aboard (cruisers) anchoring in their state controlled waters (live-aboard vessels are regulated), despite their efforts to create ordinances to do so, and it drives them nuts. The Town of Longboat Key attempted to do so with their Chapter 93. 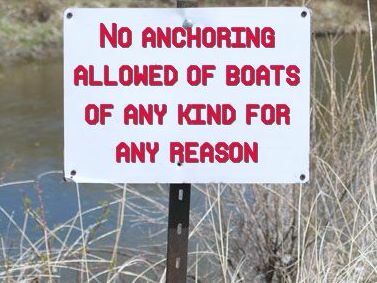 The ordinance basically says no to everything boating, but the section relating to anchoring has been shown to be in contravention with state law. I’m not specifically picking on Longboat Key, there are many other Florida municipalities that have tried to restrict anchoring by regulation, and Marco Island is another one. Now like all things legal, there was some nuance here, but on the whole, if you are a cruiser passing through Florida you can anchor where you want as long as it is not a specifically marked, and state permitted location, for now, but here comes the twist. Let’s now meet Representative Baxter Troutman, from Florida. 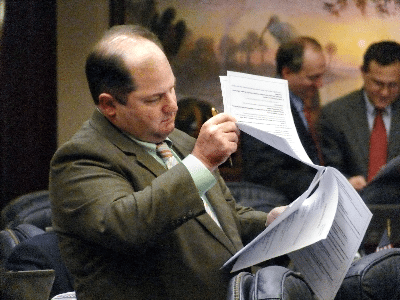 He is from Winter Haven in the middle of the state, was a Florida state representative (district 66) from 2002 to 2010, and was term-limited out of office. He is also the grandson of Ben Hill Griffin. Katherine Harris is also Ben Hill Griffin’s granddaughter. Representative Troutman is the sponsor of Florida Bill HB 1423 filed in March 2009, and it was co-sponsored by Representative Paige Kreegle (district 72) from Punta Gorda on Florida’s west coast. Buried on page 76 of 89 pages of this bill is the start of the small section you see above, with the operative line being “to explore options for regulating the anchoring or mooring of non-live-aboard vessels”. The FWC (Florida Fish & Wildlife Conservation Commission) pilot program has selected five sites for inclusion consisting of the city of Sarasota, city of St Petersburg, city of Stuart/Martin county, Monroe county/Key West/Marathon, and St. Augustine. Inclusion in this pilot programs also gives the participants the ability to created non-live-aboard anchoring regulations in the area of their jurisdiction. 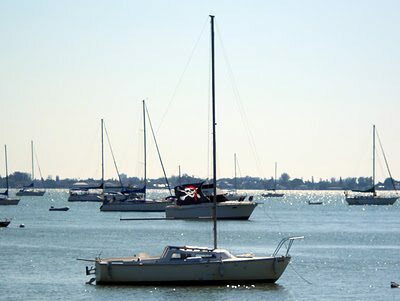 In Sarasota, the great mooring field project has not gone well. With some fanfare derelict, meaning homeless shelter boats were removed, and all of the other boats in the anchorage were pushed back from the construction area. Engineers surveyed, and pontificated, and called for helical “screw in” mooring anchors. A contractor was hired to install the first 38 anchors, and oops, the anchors didn’t hold. There was lots of finger pointing, and additional consultants were hired, and $500,000 dollars quickly evaporated. The city still has grant money left, and they will persevere. There will be a public meeting next week to discuss anchoring limitation regulations that are now possible, and I shudder. The one thing we have here is endless retired non-boaters with lots of time on their hands. The bottom line is this legislated pilot program is a poor way to solve problems that were manageable with current laws and regulations. Pollution problems can be solved with pump out boats like the new one we have above, which will currently come to your boat, for no charge in the for now free anchorage, and solve your holding tank issues. The city initially had set mooring fees in excess of $400 per month, regardless of size, which would be hard to swallow for a boater with a 26′ day sailor. Tentative rates are now by vessel size and range from $250 to $345 per month, and transient fees range from $18 to $25 per day, and oh yes, you must have proof of insurance to use the mooring field. These fees do come with with good amenities. Now that the door is cracked open, the city fathers, and mothers are chomping hard at the bit to get control of all of the anchoring in their jurisdiction, and they all lobbied hard for this. Thou shalt not anchor within view of homes, within 1000′ of the shoreline, no anchoring off Longboat Key period, and you can only stay one night, if you can find a legal place to anchor that is not in our mooring field. You don’t want to have a “Lights Out” visit from our local constabulary do you? This is a bad idea for all that boat and cruise, I trust these municipalities about as far as I can throw them, and I can’t pick them up. They are not boater’s friends. Keep a close eye on this issue, and participate in the local public meetings, or you will definitively end up holding the short straw. Comments are listed below from fellow cruisers who have reacted to Captain Bill’s story! Let’s keep the pressure up on FWC and these cities, we can win this. Well now, I wonder are the police etc going to raid all the foreclosed and abandoned homes ? Gosh, I thought this was all solved bill 327.60 I’m really tired of all this crap the cities are trying to do. I am 74 years old and have seen all I want to see of the Govt interferring with my right to sail and anchor where I choose. If I’m no mistaken, the federal govt still controls the bottom, not the cities. They may have given some of their rights to the states, but certainly not the cities. Some kind of common horse sense need to be displayed. Bottom line on this article is avoid Longboat Key/Bradenton. When the municipal authorities note the reduced tourism traffic, then they can look around and ask, where have they all gone? On page 35 of Southwinds’ October magazine is an article describing an August spill of 1.4 million gallons of raw sewage which occurred near Pensacola in an area that in June suffered from 2.2 million gallons a raw sewage spill. WOW!! That is like having nearly 7,000 boaters dump 10 gallons a raw sewage per week for an entire year! I sail to the Bahamas every year and I feel welcome in all the anchorages. I go out to eat buy fuel etc. so whats their problem? I live in Marco Island and I support the right of boaters to anchor off the shore in front of my house while in transit, seeking shelter from inclement weather, or just plain enjoying our beautiful city. I enjoy the continuing change of scenery and observing different styles, designs and rigs of vessels visiting here. However, some inconsiderate boaters seem to enjoy gaming the system by taking up permanent residence, and creating a ‘˜boat slum’ in otherwise beautiful and convenient anchorages which should be a credit to the city and not an eyesore. Solving the problem of these freeloading, waste dumping, boatbums while accommodating the majority of the cruising community is a problem which will not be easily solved. The ultimate solution toward which we are all rushing will not be satisfactory for anyone. Any lights out raid would have been aimed solely at harassing these folks.